The Toronto Raptors became, in the end, the NBA’s most inconvenient team of 2016. 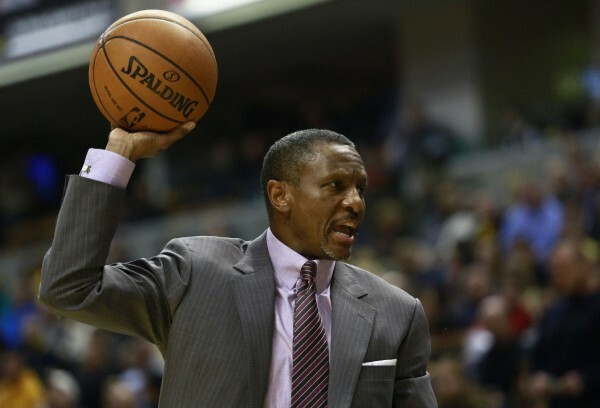 Dwane Casey’s ballclub embodied numerous contradictions and tension points. The Raptors carried sharp contrasts into the playoffs. They developed more contrasts during the playoffs. They leave the postseason as a team whose future can easily be spun in a positive or negative way. It depends on the contrasts the beholder chooses to emphasize. Before looking at the future, though, it’s important to appreciate what the Raptors achieved over the past two months. A tribute to Toronto shouldn’t sweep under the rug the Eastern Conference’s profound limitations, but for all the ways in which this team struggled in the playoffs, it ultimately succeeded. More precisely, the Raptors refused to allow their flaws to drag them down. That’s a special competitive virtue, perhaps the best reason to be optimistic about 2017 if you’re a Canadian basketball fan. The jump shot which was broken in the first round against the Indiana Pacers, and most of the second round against the Miami Heat, became a largely repaired shot by the end of the East Finals. Lowry couldn’t overcome the Cavs and LeBron James, but as long as you include the word “ELSE” at the end, “KYLE LOWRY OVER EVERYTHING” acquired genuine legitimacy in these playoffs. 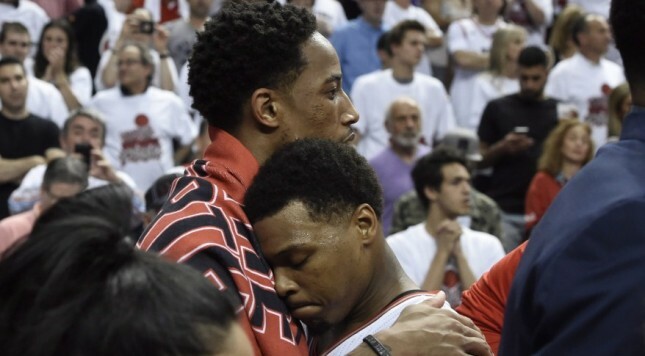 Lowry’s refusal to be defeated by surrounding circumstances represents the resilience which marked the most successful season in the history of this franchise. Indeed, for the second straight year, the team which lost to LeBron in the East Finals produced the most successful NBA season in its city’s history. The Hawks won the NBA title in St. Louis in 1958, but they had never reached a conference final in Atlanta before 2015. The Atlanta Hawks recorded their finest season last year, much as Toronto did this year with its maiden voyage to the East Finals. However, whereas the Hawks got swept — thereby failing to claim the first East Finals victory in franchise history — the Raptors found a way to win not one, but two games against Cleveland without Jonas Valanciunas, the starting center who carried them through the first nine and a half games of the playoffs. Bismack Biyombo became the central figure and hero of Toronto’s victories in Game 5 of the Miami series and Game 3 of the East Finals, earning a lot of money in the NBA marketplace. DeMar DeRozan might have irritated the living hell out of Canada in the first 11 games of Toronto’s 20-game playoff run, but a stellar Game 5 against Miami and a high-level series against Cleveland — when he found the right spots on the floor and began exercising much better judgment with his shots — repaired his postseason. DeRozan repaired his shot selection. Biyombo repaired this team’s interior defense when JV was injured. Winning two East Finals games when much of the NBA expected a sweep — and certainly gave up on this series when it headed to Toronto for Game 3 (present company very much included) — repaired the Raptors’ image. Dwane Casey, who did not coach particularly well against Indiana or Miami, performed a lot better against Cleveland, getting his players to understand “good shot-bad shot” and operate an offense which created better spacing within a far less passive approach. The Raptors, who so clearly seemed to labor under the burden of expectations versus the Pacers and the Heat — and needed a memorable gack attack from Indiana to steal Game 5 — played their best basketball in a series they lost, a series in which they lost three road games by an average of 29.3 points. To the end, this was and is a team of contradictions and inconvenient truths. Many people wanted to tune out the East Finals, and yes, five of the six games were wipeouts. However, the Raptors’ ability to win twice — especially a Game 4 in which most observers probably thought they’d wilt in the face of the Cavs’ fourth-quarter assault — forced the NBA community to respect this team and its achievements. Game 2 against Miami, in the face of a 2-0 deficit heading to South Florida for Game 3. Toronto stood on the precipice of death at several points in these playoffs, but the Raptors — through all their rough edges and injuries and fears — never stopped thinking that they could push through boundaries and barriers. Many people wanted the Raptors to exit the stage, but this team refused to budge, surviving the Pacers and Heat before forcing the Cavs to play a complete road game on Friday in Game 6. Toronto exhibited staying power in these playoffs. The Raptors — so frail in first-round exits the previous two seasons — found a way to remain on stage this time. The fact that Toronto didn’t really figure out how to play with pressure in the first round could be seen as a deficit, but in a profound sense, the Raptors’ lack of a crisp and lucid performance in the first round makes the whole of their journey that much more impressive. As this franchise of contradictions and contrasts turns its eyes to 2017, we reiterate a point made earlier: that one can very easily apply a positive or negative spin to the Raptors’ future. A team which played better in defeat than in victory during the 2016 playoffs makes itself susceptible to a wide range of evaluations and predictions. The positive spin: Learning how to compete in the playoffs — finally proving it could overcome adversity and win without its best brand of ball — will give Toronto a winning competitive makeup in 2017. The Raptors will create a marriage of will and skill (one of Doris Burke’s favorite little phrases), taking the next step in their evolution. A fully liberated team could realistically overthrow Cleveland next year. The 2016 Raptors gave Toronto and Canada their most successful NBA season to date. They extended the Cavaliers and LeBron beyond all reasonable expectations. They learned how to live with themselves when their offense wasn’t flowing and their jumpers weren’t falling. They surmounted obstacles past Raptor teams failed to overcome. You might not have liked the aesthetic qualities of the Raptors at various points in these playoffs, but Dwane Casey and his players — by failing to cede the stage on numerous occasions when it would have been so easy to do so — earned the respect of the NBA. It’s not an Eastern Conference championship, but as far as rewards go, it’s very close.